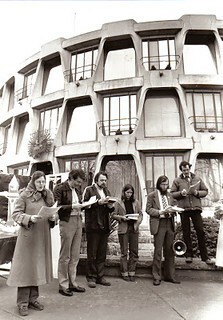 A Christian CND (Campaign for Nuclear Disarmament) vigil taking place at the US Embassy at Ballsbridge, Dublin on 9th April 1982 when the US navy planned to name a nuclear submarine Corpus Christi ("The Body of Christ"). The photo is from The Irish Times. This photo is in a blog by Patrick Comerford - see www.patrickcomerford.com/2013/10/we-stared-into-abyss-and... The same piece also has a photo of Patrick Comerford with Rev Donald Soper, renowned British activist. In this piece Patrick Comerford considers why he as an Anglican priest has been involved with nuclear disarmament, shares some of the evolution of CND in Britain and the story in Ireland. It is based on a talk given in October 2013.